In Time, Unincorporated, the best essays and commentary from a range of Doctor Who fanzines are collected and here made available to a wider audience. In spirit, this series picks up the torch from Virgin's Licence Denied collection (1997), concentrating some of the most delightful, insightful and strange writings on Doctor Who into a single source. 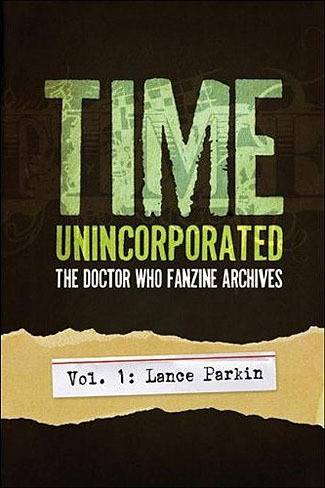 Volume 1 of this series collects 15 years of Doctor Who-related essays and articles by Lance Parkin, one of the highest-regarded Doctor Who novelists. The cornerstone of this edition is a year-by-year survey and analysis of Doctor Who that Parkin wrote for the 40th Anniversary of Doctor Who (updated to the present), as well as a myriad of Parkin's articles and columns from the fanzines Enlightenment and Matrix. Also included: Parkin's original pitch for the celebrated Doctor Who novel The Infinity Doctors (1998), his extensive advice on the art of writing and more. Lance Parkin is the author of a number of Doctor Who novels, including The Dying Days (the first original novel featuring the eighth Doctor, now a BBC ebook), The Infinity Doctors, Father Time and the bestselling The Gallifrey Chronicles. He is the author of the long-running unofficial Doctor Who chronology, A History. His other work includes the science fiction novel Warlords of Utopia and guides to the works of Alan Moore and Philip Pullman. He was a storyline writer for the soap opera Emmerdale, and went on to write four books about that series.